Freighter Anna: The 225-foot Anna built in 1932 in Scotland, began her career as a coastal freighter in European waters and saw duty as an arms carrier during World War II. Alas, in 1981 Anna was seized in a South Florida drug bust. She once served the shipyards of Scotland and ran supplies during World War II. In 1981 she was confiscated for drug smuggling off the coast of Florida. With the help of the Jacksonville Reef Research Team and the Navy Explosive Ordinance Team, the Anna was reefed and now lies on her starboard-side in 110 feet of water, providing a habitat for sea life. 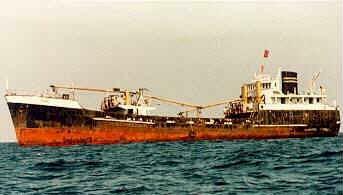 Her placement as an artificial reef occurred on July 16th, 1986 offshore Jacksonville. The perils of time, however, have caused much of her hull’s mid-section to collapse. According to Captain Tim O’Donnell a wreck called the Lost Barge can be found close to the Anna wreck.